Book "Open access in Southern European countries"
This book is promoted by FECYT. The Spanish Foundation for Science and Technology (FECYT) is a public foundation under the Spanish Ministry of Science and Innovation whose mission is to strengthen the value chain of knowledge by fostering science and innovation and trying to integrate them and bring them closer to society, in response to the needs and expectations of the Spanish science, technology and enterprise system. The Foundation’s goal is to be recognized by Spanish society as a key reference in the dissemination, information and measurement of science and innovation. It also wishes to contribute to the development of a knowledge-based economy. Access full text book Read More! As a cornerstone of Open Archives program, the Open Archives Initiative (OAI) develops and promotes interoperability standards that aim to facilitate the efficient dissemination of content. Usually referred to as simply, the OAI protocol, Open Archives Initiative Protocol for Metadata Harvesting (OAI-PMH), currently in version 2.0, defines a mechanism for data providers to expose their metadata. It collects the metadata descriptions of the records in an archive so that services can be built using metadata from many archives. Dublin Core metadata record, which is used with OAI-PMH protocol, can describe physical resources such as books, digital materials such as video, sound, image, or text files, and composite media like web pages. In simple terms, the protocol allows people to harvest metadata from digital libraries, repositories or reading platforms. Over time, Open Archives program has expanded to promote broad access to digital resources for eScholarship, eLearning, and eScience. Accordingly, the implementation of OAI protocol ensures the increasing number of users, and a more wide accessibility with increased benefits towards scholars, researchers, students, libraries, universities and other academic institutions. 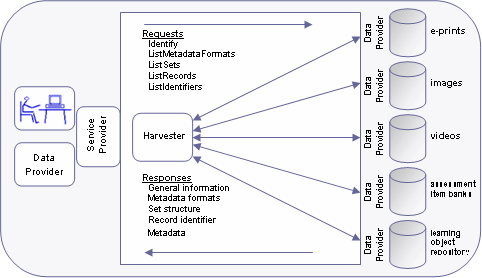 With the OAI-PMH protocol and these means of exposing structured metadata, InTech as a Data Provider allows Service Providers such as citation indexes, scientific search engines, scholarly databases, and scientific literature collections to harvest the metadata from our repository and thus make our publications available to a broader academic public. (The image is obtained from http://wiki.cetis.ac.uk/images/9/9d/OAI-PMH_overview.png) Read More! Here is the link to an interesting map from Eprints of newly added Institutional Repositories. It helps in creating a vivid image of the Open Access awareness growing on a truly global scale. Links to repositories are also available with short descriptions added. Hopefully, the creators will utilize the potential of this map becoming a useful and illuminating tool for Open Access advocates. When we talk about the economics of open access, the conversation usually begins with the high cost of traditional journal subscriptions. For a nice summary of the argument that the economics of journal pricing is out of control, this portion of the ACRL toolkit on scholarly communications is an excellent resource. But that is only the beginning of the discussion. There is a lot more to say about open access economics. One great source to grasp the nuance of the issues is a 2009 issue of the journal Economic Analysis and Policy, which itself made the transition from toll access to open availability under a Creative Commons Attribution license. A special issue of the journal was dedicated to the economics of open access; the full contents are linked to this blog post, which make finding them much easier. I can especially recommend the first two articles in this special issue of EAP. John Willinsky does an excellent job in “The Stratified Economics of Open Access” of analyzing traditional publishing market segments and looking at how each is experimenting with open access. Conley and Wooders, in “But what Have you Done for me lately,” ask the very basic questions about what publishing an academic article should cost and what the most economically efficient model for scholarly communications might look like. As I said, the conversation usually begins with high journal prices. Open access is not a solution, per se, to the problem of journal costs, but it is a solution to the access problem that is created by skyrocketing prices. For most academic authors, the issue of how much publishing really costs and how much of a university’s budget is actually going into shareholder value at Elsevier or Informa is very much secondary. Their concern is how to get their work into the hands of those who need it and might be able to use it. High subscription costs prevent that access and thus reduce the impact of scholarly work. That is the problem that new models of distributing scholarship, most of which are forms of open access, can solve. As Conley and Wooders’ article makes clear, open access is not free in the sense of being without any costs, although consumers of open access articles do get the information they need without charge. Open access models are really about ways to streamline and redistribute the costs of publication so as to solve the access problem that is becoming so severe in the traditional system. When we talk about the economics of open access, there are two factors that we should not forget. First, the are costs, known as lost opportunity costs, associated with traditional publishing that are recaptured by open access. Every time a researcher or teacher cannot get to the information she needs to do her work, or must obtain it by labor-intensive means like interlibrary loan or direct contact with the author, time and knowledge, which are both worth money, are wasted; open access reduces that loss. Second, open access provides the benefit of greater impact to the scholarly authors of articles made accessible through the various OA models. This benefit for the authors, like the benefit to the reader of quick and toll-free access, increases the overall value of research. When we examine the economics of open access, the increased value of the research itself must be part of the equation. How can librarians prove that their libraries still provide education? Their situation is nohow a warming one. However, the solution couldn’t be more simple. Libraries order journals and books. The cost of academic material is climbing rapidly (from 1989 to 2003 by 315% according to ARL). This is possible because the market is dominated by a small number of large publishers who can demand very high prices for their publications. The world production of scholarly outputs, by contrast, has been at least doubled. Even the most well endowed library cannot afford to provide all of the research material necessary for its students/researchers, let alone the one in the developing world. In addition, library budgets have been severely slashed everywhere. researchers must do without access to some of the journals critical to their research. so are all the benefits of research. This would present an insoluble problem in the print machine era, however with internet technology available, both crises may be answered with Open Access to research material. The middleman can now be left out of the picture and mutual responsibility in promoting the wide dissemination of knowledge is now solely on librarians and publishers. SPARC is calling recently for stories being collected for the OA Week about Open Access causing major swerve in specific scientific study. Thus, even if it didn’t prove as a money saving solution, it will, undoubtedly prove as a “community-saving” solution. That librarians are strong advocates for Open Access is obvious when recognized that SPARC, one of the strongest OA organization on a global level, was founded by the research library community. they should, but the idea is still in its growth process and the awareness is yet to be raised. 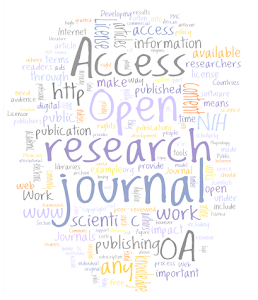 Open Access: what is it and why should we have it? Scholars write articles to be read—the more access to their articles the better—so one might think that the open-access approach to publishing, in which articles are freely available online to all without interposition of an access fee, would be an attractive competitor to traditional subscription-based journal publishing. The new US administration could implement such a system through simple FRPAA-like legislation requiring funding agencies to commit to this open-access compact in a cost-neutral manner. Perhaps reimbursement would be limited to authors at universities and research institutions that themselves commit to a similar compact. As funding agencies and universities take on this commitment, we might transition to an efficient, sustainable journal publishing system in which publishers choose freely among business models on an equal footing, to the benefit of all (Full text). Scholarly publishing is going through a transformation as a result of digital means of communication, coupled with the financial predicament of libraries. With the most recent economic downturn, access to scholarly articles, so important to research progress and public advancement, will no doubt suffer. Open-access scholarly journals have arisen as an alternative to traditional subscription scholarly journals. Open-access journals make their articles available freely to anyone, while providing the same services common to all scholarly journals, such as management of the peer-review process, filtering, production, and distribution. Since open-access journals do not charge subscription or other access fees, they must cover their operating expenses through other sources, including subventions, in-kind support, or, in a sizable minority of cases, processing fees paid by or on behalf of authors for submission to or publication in the journal. Universities subsidize the costs of subscription journals by subscribing to them. Universities and funding agencies can provide equitable support for the processing-fee business model for open-access journals — to place the subscription-fee and processing-fee models on a more level playing field — by subsidizing processing fees as well. The compact for open-access publishing equity supports equity of the business models by committing each university to "the timely establishment of durable mechanisms for underwriting reasonable publication charges for articles written by its faculty and published in fee-based open-access journals and for which other institutions would not be expected to provide funds." MELIBEA provides a searchable directory of open access (OA) policies. It describes the existing policies of each mandate listed and provides a clear list of criteria (e.g. length of possible embargo). It also describes itself as a validator as it assesses each policy against a fixed set of qualitative and quantitative criteria. These are used to provide each mandate with a score that indicates how 'open' it is. For example the Wellcome mandate scores c.72% open, whereas the European Research Council (ERC) scores 60% openness. A recent article in PLoS One presents an analysis of the percentage of articles available open access in 2009. Entitled 'Open Access to the Scientific Journal Literature: Situation 2009' the paper used a random sample of 1837 articles to determine the percentage that are available OA either on the journal site or within a repository. The findings show that the greatest percentage of OA articles on journal sites are from the biomedical areas (c.13% of articles) and the lowest percentage in physics and astronomy (c.3%). However the percentage available in repositories showed a quite different spread. The lowest number available in repositories was in the biomedical subjects (ranging from 4.6-7.8%) and the highest was in the earth sciences area (25.9%). Chemistry showed the lowest total OA availability (13% total). Of articles published in 2008, they found an average 8.5% freely available at the publishers' sites plus an additional 11.9% that could be found using search engines, making the average overall OA percentage 20.4%. 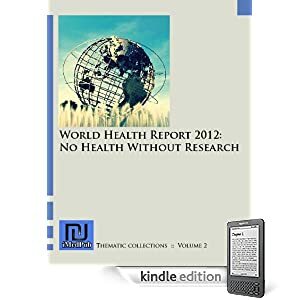 It should be noted that since they looked at articles published prior to 2009 the results will not reflect the mandate enforced by the NIH at the start of 2008 – it is likely that a similar study of articles published in 2009 and 2010 (including those for whom 12-month embargoes will have expired) will be far larger in the biomedical arena. Developing a sound business model is a critical concern of publishers considering open-access distribution. Selecting the model appropriate to a particular journal will depend not only on the expense hurdle that must be cleared, but also on the publisher’s mission objectives, size, business management resources, risk tolerance, tax status, and institutional or corporate affiliation. This Web site and accompanying guide provide an overview of income models currently being used to support the open-access distribution of peer-reviewed scholarly and scientific journals. These resources will be a useful tool both for publishers exploring new potential sources of income and for libraries weighing where to direct meager library funds. : supply-side models, funded primarily by producers of the content or by proxies that pay on their behalf. Demand-side moels: funded primarily by consumers of the content or by proxies that pay on their behalf. “Income models for Open Access: An overview of current practice” examines the use of supply-side revenue streams (such as article processing fees, advertising) and demand-side models (including versioning, use-triggered fees). The guide provides an overview of income models currently in use to support open-access journals, including a description of each model along with examples of journals currently employing it. Download the PDF. Article "Open access: implications for scholarly publishing and medical libraries"
Purpose: The paper reviews and analyzes the evolution of the open access (OA) publishing movement and its impact on the traditional scholarly publishing model. Procedures: A literature survey and analysis of definitions of OA, problems with the current publishing model, historical developments, funding agency responses, stakeholder viewpoints, and implications for scientific libraries and publishing are performed. Findings: The Internet's transformation of information access has fueled interest in reshaping what many see as a dysfunctional, high-cost system of scholarly publishing. For years, librarians alone advocated for change, until relatively recently when interest in OA and related initiatives spread to the scientific community, governmental groups, funding agencies, publishers, and the general public. Conclusions: Most stakeholders acknowledge that change in the publishing landscape is inevitable, but heated debate continues over what form this transformation will take. The most frequently discussed remedies for the troubled current system are the “green” road (self-archiving articles published in non-OA journals) and the “gold” road (publishing in OA journals). Both movements will likely intensify, with a multiplicity of models and initiatives coexisting for some time. This paper reviews the factors and events leading up to the open access (OA) movement in scholarly publishing, including the evolution and current status of the National Institutes of Health public access policy. Differing points of view of major stakeholders, such as publishers, librarians, scientists, funding agencies, and consumers are summarized. Open access has and will continue to impact traditional scholarly publishing, serials pricing, and medical libraries in general. Open access issues may impact decision making in serials acquisition and management. Librarians should take a lead in communicating important OA-related developments to user groups and administration. Librarians can play major roles in connection with this new movement. A knowledge economy has been defined as: “…one in which the generation and exploitation of knowledge has come to play the predominant part in the creation of wealth. It is not simply about pushing back the frontiers of knowledge; it is also about the more effective use and exploitation of all types of knowledge in all manner of economic activities” (DTI 1998). In a knowledge economy, innovation and the capacity of the system to create and disseminate the latest scientific and technical information are important determinants of prosperity (David and Foray 1995; OECD 1997). Scholarly publishing plays a key role, as it is central to the efficiency of research and to the dissemination of research findings and diffusion of scientific and technical knowledge. However, advances in information and communication technologies are disrupting traditional models of scholarly publishing, radically changing our capacity to reproduce, distribute, control, and publish information. One key question is whether there are new opportunities and new models for scholarly publishing that would better serve researchers and better communicate and disseminate research findings (OECD 2005, p14). Debate on the economics of scholarly publishing and alternative publishing models focuses almost entirely on costs, but from an economic perspective the aim is to have the most cost-effective system, not (necessarily) the cheapest. And however much one studies costs, one cannot know which is the most cost-effective system until one examines both the costs and the benefits. Hence, the aim of this project was to examine costs and benefits, and in so doing to inform policy discussion and help stakeholders understand the institutional, budgetary and wider economic implications of three of the major emerging models for scholarly publishing (i.e. subscription publishing, open access publishing and self-archiving). It seeks to build on and extend recent work on the costs and benefits associated with alternative scholarly communication models (Houghton et al. 2006) and respond to some of the gaps and challenges identified in the UK Scholarly Journals Baseline Report (EPS et al. 2006). * Phase II: Quantification of costs and benefits – sought, where possible, to quantify the costs and benefits identified in Phase I; identify, and where possible quantify, the cost and benefit implications for each of the main players in the scholarly communication system; and, where possible, compare the costs and benefits of the three models for the main players in the scholarly communication system. While wide-ranging in scope, an important focus of the work was the implication of the three models for UK higher education and for journal and scholarly monograph publishing. Portable Document Format (pdf) File [ 117 Kb ] Read More! The decision to launch an Open-access Fund is a complex one for many reasons. Establishing a clear understanding of your Fund’s goals, the policies that will govern it, how it will be administered, and what tools can be used to evaluate the Fund’s results all involve careful deliberation and discussion. The relative novelty of the category, combined with demographic, philosophical, and political differences among the institutions that have established Open-access Funds to date combine to create an environment in which there are not yet transferable templates for the simple and straightforward creation of Funds. As a result, it may be challenging for those contemplating the launch of an Open-access Fund to move ahead with absolute confidence and clarity. And yet, despite this uncertainty, more than a dozen institutions (as of this writing) have launched Open-access Funds. This is a concept that clearly intrigues some within the scholarly communication community. As such, it bears further consideration and analysis. See the SPARC Guide Read More! This video was prepared by the UK branch of Dorling Kindersley Books. Originally meant solely for a DK sales conference, the video was such a hit internally that it is now being shared externally. We hope you enjoy it (and make sure you watch it up to at least the halfway point, there's a surprise!). The Online Guide to Open Access Journals Publishing provides practical information and tools to support the efforts of scholars and other small teams producing independent Open Access journals. The guide has been developed by Co-Action Publishing and Lund University Libraries Head Office with support from the National Library of Sweden and Nordbib. Read More! The growing field of global health delivery is in need of technological strategies to improve transparency and operations research. Our organization has implemented several simple “Web 2.0” strategies while delivering medical and public health services in rural Nepal. These strategies help Nyaya Health improve transparency, receive critical commentary from outside experts, and compare approaches to organizing budgets, pharmaceutical procurement, medical treatment protocols, and public health programs. The platforms include quantitative outcomes data and logistics protocols on a wiki; an open-access, online deidentified patient database; geospatial data analysis through real-time maps; a blog; and a public line-by-line online budget. On December 10, the White House Office of Science and Technology Policy (OSTP) announced a public forum to discuss public access to federally funded research. "The administration is dedicated to maximizing the return on Federal investments in R&D," reads the announcement in the Federal Register [PDF]. The discussion focuses largely on proposal to extend to other governmental agencies—such as the National Science Foundation, the Department of Defense, and NASA—a public access mandate similar to the one governing National Institute of Health-funded research. The National Institute of Health (NIH) is itself the largest federal funder of research, awarding more than $30.5 billion annually, and is covered by the December 2007 mandatory public access policy requiring the deposit of funded articles into the PubMed Central digital archive. The OSTP post also goes on to outline a number of the arguments commonly put forward in favor of open access, including simplified access to scholarly publications and a central storage and search infrastructure that would facilitate researchers' ability to use the materials. In line with the Obama administration's determination to use the web as a means of engaging with the public, OSTP is soliciting comment via blog in three parts: on implementation (December 10 to 20), features and technology (December 21 to 31), and management (January 1 to 7). The discussion on OSTP's blog also parallels a more traditional call for public comment to be published in the Federal Register. In the comments on the blog, dozens of users have weighed in on OSTP's detailed initial questions about the implementation of a mandate, including which agencies should enact public access policies, what length embargo period is appropriate, which version of an author's article to submit, and whether deposit should be mandatory or voluntary. The OSTP announcement comes as yet another encouraging sign for open access advocates, following the reintroduction of the Federal Research Public Access Act (FRPAA) in the Senate this year by Senators Joseph Lieberman (I-CT) and John Cornyn (R-TX), and a number of open access resolutions made by faculties nationwide. Moreoever, given the Obama administration's consistent call for transparency and its recent push for a Comprehensive Open Government Plan, those advocates see the White House as a potentially great ally if comes out strongly in favor of open access. "It's confirmation that this is an issue that is of national importance," said Heather Joseph, executive director of the Scholarly Publishing and Academic Resources Coalition (SPARC), adding that, while many librarians have been staunch advocates for the cause of open access, the administration could influence the debate on a much broader level. It also seems clear that, aside from the political and legislative implications, a statement from the White House could potentially persuade some administrators and faculty at institutions where open access mandates from other campuses have failed to do so in the past. But any federal open access mandate also stands to come back around as a library and digital archives issues eventually. “[Libraries] were the first community to clue in, on a coordinated scale, to what an open access world would look like,” Joseph said. And it will likely come back down to librarians and archivists to work out many of the practical aspects of the mandate if and when it is handed down from the legislative level. During the comment period, it will be up to librarians to advise on how an public access mandate can be shaped in order to add the least additional burden to libraries and archives. A different policy governing each governmental agency would only increase the cost of implementation, Joseph said, and it is incumbent upon librarians to help divine the closest thing to a one-size-fits-all solution Read More! Open-access (OA) literature is digital, online, free of charge, and free of most copyright and licensing restrictions. What makes it possible is the internet and the consent of the author or copyright-holder. In most fields, scholarly journals do not pay authors, who can therefore consent to OA without losing revenue. In this respect scholars and scientists are very differently situated from most musicians and movie-makers, and controversies about OA to music and movies do not carry over to research literature. OA is entirely compatible with peer review, and all the major OA initiatives for scientific and scholarly literature insist on its importance. Just as authors of journal articles donate their labor, so do most journal editors and referees participating in peer review. There are two primary vehicles for delivering OA to research articles: OA journals and OA archives or repositories. OA archives or repositories do not perform peer review, but simply make their contents freely available to the world. They may contain unrefereed preprints, refereed postprints, or both. Archives may belong to institutions, such as universities and laboratories, or disciplines, such as physics and economics. Authors may archive their preprints without anyone else's permission, and a majority of journals already permit authors to archive their postprints. When archives comply with the metadata harvesting protocol of the Open Archives Initiative, then they are interoperable and users can find their contents without knowing which archives exist, where they are located, or what they contain. There is now open-source software for building and maintaining OAI-compliant archives and worldwide momentum for using it. OA journals perform peer review and then make the approved contents freely available to the world. Their expenses consist of peer review, manuscript preparation, and server space. OA journals pay their bills very much the way broadcast television and radio stations do: those with an interest in disseminating the content pay the production costs upfront so that access can be free of charge for everyone with the right equipment. Sometimes this means that journals have a subsidy from the hosting university or professional society. Sometimes it means that journals charge a processing fee on accepted articles, to be paid by the author or the author's sponsor (employer, funding agency). OA journals that charge processing fees usually waive them in cases of economic hardship. OA journals with institutional subsidies tend to charge no processing fees. OA journals can get by on lower subsidies or fees if they have income from other publications, advertising, priced add-ons, or auxiliary services. Some institutions and consortia arrange fee discounts. Some OA publishers waive the fee for all researchers affiliated with institutions that have purchased an annual membership. There's a lot of room for creativity in finding ways to pay the costs of a peer-reviewed OA journal, and we're far from having exhausted our cleverness and imagination. For a longer introduction, with live links for further reading, see my Open Access Overview, http://www.earlham.edu/~peters/fos/overview.htm.